Likud MK rushed to Knesset for vote - while still hooked up for infusion from hospital visit. A coalition lawmaker was rushed from a hospital to the Knesset on Wednesday, despite being in the middle of treatment. 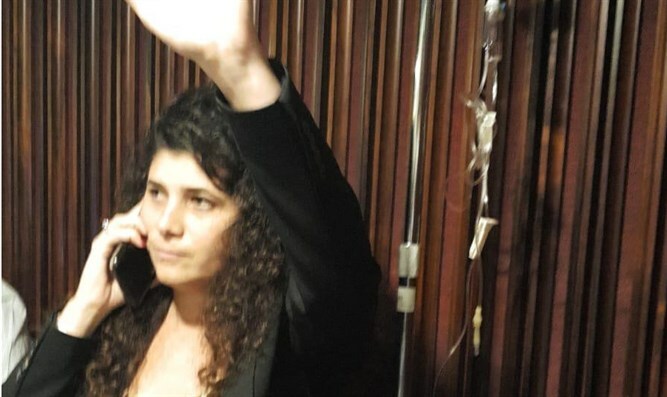 MK Sharren Haskel (Likud) was being treated in Meir Hospital in the central Israeli city of Kfar Saba Wednesday, when she was called in to the Knesset for a vote, after opposition MKs refused to abstain from the vote to permit her to remain in the hospital. As a courtesy, MKs will refrain from voting in order to permit a fellow MK on the opposing side to avoid returning to the Knesset during a hospital visit, major family event, or other circumstance which would make participating in the vote difficult. Thus, the ‘missing vote’ of the MK who could not participate is effectively cancelled out by the ‘missing vote’ of the opposing MK who abstains. In this case, however, opposition lawmakers refused to extend the courtesy, because of the coalition’s narrow majority.